Pro Pharma's Website is designed to provide the ultimate user-friendly experience with improved navigation and functionality, allowing visitors to access service/product information but be able to share information across major social network. 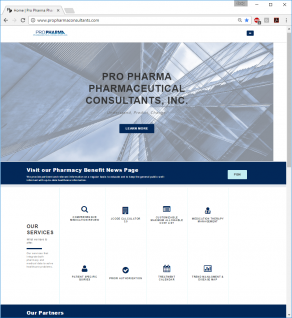 CHATSWORTH, Calif. - Feb. 28, 2017 - PRLog -- Pro Pharma Pharmaceutical Consultants, Inc., a healthcare consulting firm which focuses on data analytical expertise integrating medical, pharmacy, and ancillary services data, has announced the launch of its newly updated and redesigned Website. "Re-designing and updating the Pro Pharma Website to a restructured, streamlined, easier to navigate, and more informative Website were a few of our major priorities." – Craig Stern, President. Dr. Stern goes on to state, "As an analytical thought leader, it was important for us to provide information regarding solutions, services and trends which are easily accessible as possible for our current and prospective clients. We make it a point to provide our clients with the most accurate, up-to-date information available in a user-friendly format." Pro Pharma's CEO Carol Stern, states that "one of the most noticeable changes on our new Website is our newly designed service and product pages which clearly describe and define how to identify and manage problems more efficiently. When redesigning our Website, we had our clients in mind, as they are our first priority." In addition, Pro Pharma's Education section is a tremendous resource which provides visitors with access to latest news, articles, and presentations. This section also features our Pharmacy Benefit News™ (available as a bi-weekly newsletter) which provides in-depth details and analysis on current issues surrounding healthcare. By browsing through our "About US" sections, you'll get a pretty good idea of who we are, what we do as a company and what others are saying about us. We wanted to give our clients an opportunity to know us better; who we are as a company and who are the leaders driving the Pro Pharma Team. Carol Stern, CEO, states, "Pro Pharma's goal is to educate our clients so that they have the appropriate decision-making tools at their fingertips. We anticipate that the redesign of the Pro Pharma Website and accompanying Information Pages will satisfy in that endeavor." We pride ourselves on being a thought leader in both the Analytical and Technology fields and look forward to hearing any feedback from you.